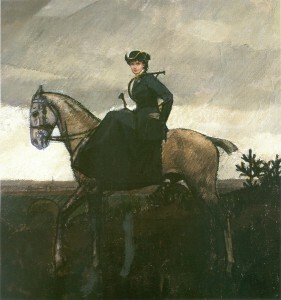 This painting shows a reputable horsewoman from the beginning of the 20th century in France. She was a member of the hunting club ‘Par Monts et Vallons’, active in the woods of Senlis, North of Paris, where hunting to hounds still is practised. On the picture she has the French hunting horn on her shoulder because she was one of the few women who really blew on the horn to give the traditional signals about the course of events in the hunting field. Her husband Mr. Serge André commissioned this painting, but long before her marriage she was already active in the hunting field under her maiden name D.J. Legendre. Her horse has the type of an English hunter, which is not surprising because the French riders where well aware of the exemplary performances of the English hunting sport, as Jules Pellier stated in his book ‘La selle et le costume de l’amazone’, Paris 1897. Nevertheless Boutet de Monvel has rendered in this painting the French elegance combined with feminine pluck and professionalism, which would have fit also in our modern time.